Experience Enterprise Class Agility with the power of Artificial Intelligence (AI) and Machine Learning (ML) in SwiftEnterprise 5.0! 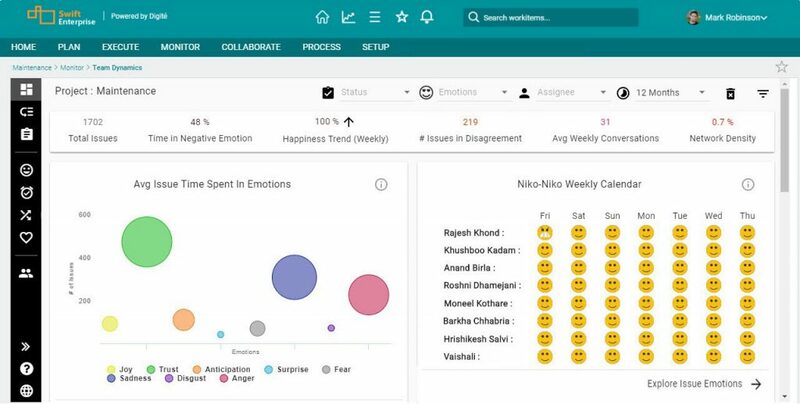 SwiftEnterprise 5.0 brings to you Team Dynamics – Emotional Intelligence Analytics – that gives you powerful insights into your team’s emotional health and its impact on team and project performance, based on their interaction on various project tasks! We have also started our journey of AI based assistance by going conversational. Now, using Slack, talk to our Chatbot to get quick information about your work and perform routine actions right from your Slack channel. 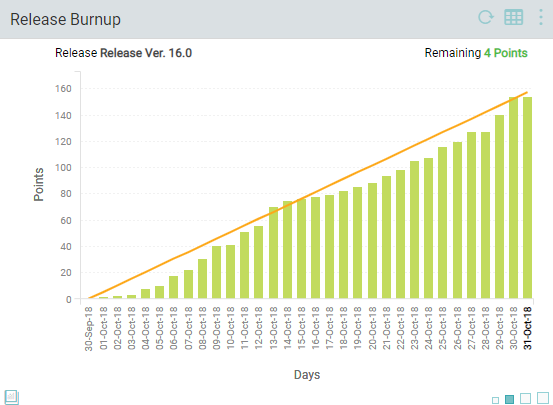 For our Agile projects, two new charts – Sprint Burndown and Release Burnup – have been introduced, with suggestions to help you take timely action to keep your Sprint and Release commitments. Finally, your ability to slice and dice project data across multiple task types has become turbocharged with our brand new Pivot Analytics! The Pivot chart lets you easily drag and drop work-item attributes in a 2-dimensional matrix and understand their correlation in both tabular and graphic forms. We all understand the impact of a happy self-organizing team delivering value with high quality. The opposite is also true. Unhappy teams deliver bad quality in unacceptable timelines. Our products now come with the power of Team Dynamics. Using Artificial Intelligence and advanced NLP techniques including Sentiment Analysis, Team Dynamics help you understand how your teams perform and react across projects, in real-time. Multidimensional Team Dynamics Metrics (TDM) are generated by analyzing the sentiments, tones, disagreements, trust, and conflicts in team conversations within the project, using Advanced AI/ML to give you insight on how happy or unhappy the team is feeling. By connecting with DeepAffects, TDM provides insights into the team’s dynamic state (Performing, Storming, Outperforming etc. ), trust network, conflicts & more. This module is available on our SaaS instances, as an add-on to any of our products. The new Sprint Burndown chart offers you a clear view of the team’s progress as-of today, in terms of remaining hours for the ongoing sprint. If the team is lagging in its planned progress, then the summary highlights the projected spillover. It also suggests the percentage at which you need to spend the remaining effort higher than the current burn down rate to avoid the projected spillover. With the new Release Burn-up chart, you can easily view the work being completed by the team for the current release, in terms of points and count of cards. The ideal burn-up depicts the rate at which work needs to be performed to complete the release scope on time. 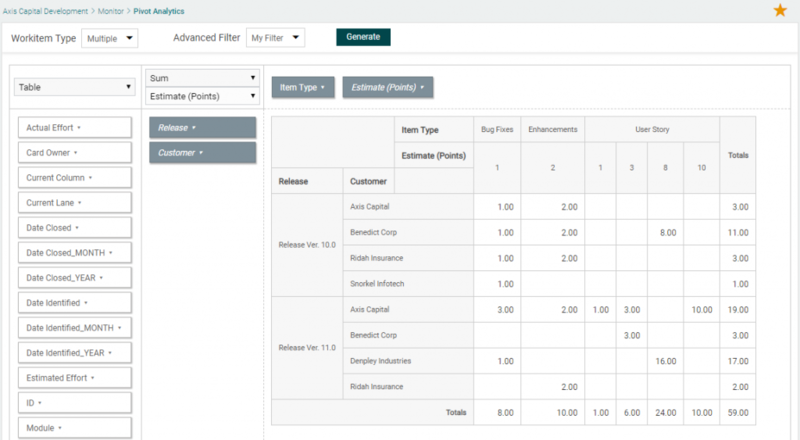 Now you can quickly view Summary data at the project level, for one or more work-items, with your choice of row or column attributes, using the new Pivot Analytics. The Pivot chart is highly scalable and configurable, with the ability to display voluminous data in a tabular or chart format based on various combinations of work-item fields in rows and columns. It allows you to visualize it in tabular form or in various chart types. To learn more and to see SwiftEnterprise in action, please contact Sales OR Request for a Custom Demo.